BarCamp Prishtina continued the positive start of the new season with another marvelous edition that comprised of a set of interesting speeches and intriguing stories for the audience. The already-established community consisting of zealous people, who seek to innovate and develop themselves both in academic and professional terms, and powerful talks made this edition just as exciting as the preceding ones. 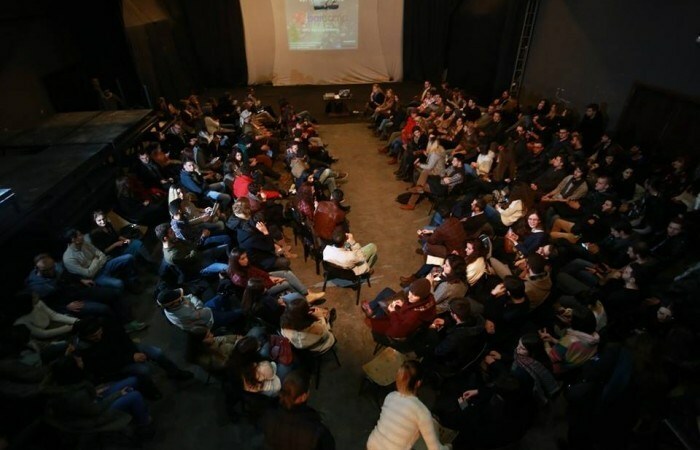 The main theme of the twenty-seventh edition of BarCamp Prishtina was Architecture, which refers to the process and the product of planning, designing, and constructing buildings and other physical structures. The main purpose of this theme was to generate discussions on how to protect our cultural heritage and to offer the audience essential information on how architecture is prevalent in Kosovo through a modern architecture approach. The speakers provided us with stories on their recent activities and experiences on architectural projects, as well as stories on how our cultural heritage has been preserved after a devastating conflict. Since BarCamps offer people a place where they can all share ideas and interesting personal stories, this BarCamp definitely provided participants with fruitful talks on how these people have literally shaped the image of Kosovo. In addition, certain discussion points were raised to target specific issues that are currently prevalent in Kosovo. Three speakers were invited in this edition, consisting of Zana Hoxha, Dukagjin Hasimja, and Ajhan Bajmaku. All of them provided their insights on the projects they have been involved in and how they influenced and used architecture during their fruitful career. Zana Hoxha, a professional archaeologist and the representative of Kosovo on the board of the Balkan Museum Network, shared her experience in Cultural Heritage without Borders in Kosovo. Involved in multiple projects connected with the revitalization of historic buildings in Kosovo, Zana disclosed some of these projects including castles and towers around Kosovo. She also put an emphasis on the importance of our cultural heritage and how these buildings can serve as touristic venues, thereby promoting the development of Kosovo. Dukagjin Hasimja, a professional architect with a massive background in academic education, particularly in the University of Prishtina, Faculty of Engineering and Architecture, shared some of his work since 1987 until today. Dukagjin gave his insight on his journey to success by winning awards for his projects in multiple competitions, as well as several municipal and urban regulatory plans in which he was involved. He also put an emphasis on the lack of awareness in Kosovo, as the work of architects is undermined. Ajhan Bajmaku, a professional architect and a professor at the University of Prishtina, Faculty of Engineering and Architecture, showed some of the projects produced by his architectural studio. He focused more on the prevalence of kitsch-ism, or the concept of considering art, objects, or design as poor because of excessive garishness or sentimentality. Ajhan extended this concept and connected it with what he called “tallavarchitecture,” by giving specific examples from Kosovo, some of which go unnoticed in the eyes of the public. Another great edition of BarCamp Prishtina has come to an end. It certainly was the best way to close a fruitful year. Until the upcoming edition of BarCamp next year, socialize, collaborate, inspire, and innovate! See you soon in BarCamp Prishtina #28.